Noun. B- and b-. Late 19th century. (Proprietary name for) a concentrated essence of beef; a drink of this. When I was little, my Dad used to take me to his workshop. 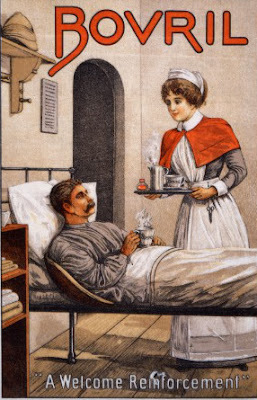 It was always freezing there, so one thing I looked forward to was a rich cup of steaming Bovril, something he always kept in stock along with Ryvita and peanut butter. For anyone that's never sampled this culinary delight, Bovril comes as a viscous black liquid, somewhat akin to tar or molasses. You put a spoonful in a cup, add hot water, and voila! A deliciously salty beef drink is yours to savour. Now, I grant you, its dictionary definition - a concentrated essence of beef - does sound rather gag-inducing, as do meat drinks generally (a porkshake, anyone?). While the idea of a hot beef drink may not sound appetising, it sounds a lot better than adding Bovril to porridge (as they do in Malaysia apparently), and infinitely less barf-worthy than a hot Bovril milk drink which, even to my British-cuisine hardened stomach, makes me retch just a little at the thought of it. In saying all of this, however, there is a dogged pride in foods that should otherwise be found repellent, and I dare say that if someone slapped down a cup of hot Bovril in front of me right now, I'd knock it back with a hearty laugh and derisory sneer at the delicately constituted tastebuds of modern youth. Because that's what we're supposed to do as we get older, isn't it? After all, my parents regaled me with tales of gratefully dining on tripe and sugar sandwiches, so Bovril will give me that, and I'm thankful for it. I eagerly look forward to the day when I can disdainfully dismiss the modern palate: "Why, when I was a baby, my mother fed me bottles of beef essence washed down with a quart of wolf's milk. Thankful I was too! Now that was a real generation, not like today's workshy, namby-pamby, good-for-nothing, know-it-all ... climbed a mountain ... blind drunk at the time ... took on seven of them ..." and so on for several hours of further incoherent rambling. Where was I? Oh yes - Bovril. You really must try it. Essence of beef ... mhmmmm. Do you have any memories of Bovril or another meat drink? Are there any loathsome foods you want to reminisce over in your old age? Do please leave your most moo-ving comments below. Hadn't even heard abou this. Mmm... I don't know if I could try it. One of the weirdest and totally disgusting snacks that I used to like as a 5-year-old was a raw egg beaten with cocoa and butter. Thank god my mom came to her senses and realized I could get salmonella. Hmm ... no ... I'd probably try it (if I was put on the spot by an insistent host), but raw egg with anything is a bit of a no-no for me. Is this like a sort of bouillon? Because I've never heard of anything like this. 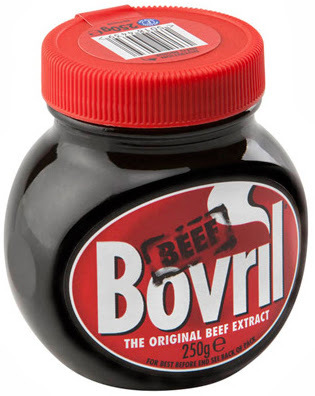 I don't think (and I'm talking off the top of my head here) it would be classed as broth because there are no solid pieces in Bovril - it's just water flavoured with 'the essence of beef' (I can't stop saying that). It's closer to a stock, except one that is specifically designed as a drink. I've decided I'm going to go and buy some to relive my youth. Why make Beef into a hot drink?? Enjoy eating Beef and enjoy a hot drink but why mix the two. Sounds like it was something invented around war time when food was rationed so you could have a taste of what you were missing. Glad i missed that!!! My brother worked at what we called 'the freezer' (slaughterhouse, abattoir) when I was growing up in NZ, and he often brought up home sweetmeats, tripe, livers, kidneys, brains, tongues, etc. As a kid, I found it all quite disgusting, but had to eat it. Ugh! We had Bovril in NZ, but have never seen it here in Canada. It was often added to stews etc., as well as being a hot drink. I like liver and kidneys. I've never had tongue but I would try it. I'd take a bit of persuading to eat brains. And tripe ... wow ... that is just the most disgusting looking food ever. Ever, ever, ever. The best part of a mug of Bovril is about 2 minutes after you've finished it, and you then realise that it's very unlikely anything worse will happen to you for the rest of the evening. Unless someone turns up and hands you toast and Marmite, right? Bovril is evil, and don't you dare compare it with a slip of marmite on soft, hot, fresh, white toast.